My wife and I have lived on Kauai most of our lives and have raised our children here. Kauai is a paradise this side of heaven. When you discover Poipu, you will realize that this is one of Kauai's sparkling areas. We choose to swim and surf in Poipu on a regular basis because it refreshes and revitalizes our souls. Part of what makes Kauai unique, is the abundance of rainfall on the island. Even though we are considered the wettest place in the world, Poipu is unique as the rainfall is usually under 20 inches annually. Which means, even though we live fifteen minutes away, where it can be cloudy and rainy, we drive to Poipu and find it sunny, warm and beautiful. 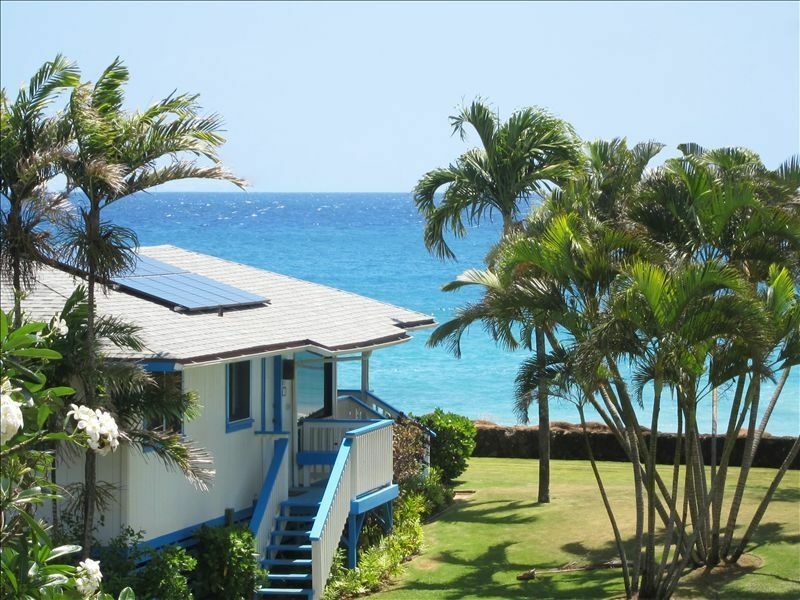 We would not want to see our guests disappointed, so we choose Poipu has the place to have vacation homes. You will find our beachfront home very cozy and romantic. We have many guests who come year after year and some that will come twice a year. They find that they can come to a place, relax and reconnect with their loved ones in ways they may not have know existed. Watching the waves break from our living room and sometimes seeing the whales breach one-hundred yards from shore, is a unique and lovely experience. Also, the kids love Poipu Beach Park, which is less than thirty seconds from our home. Unobstructed ocean views from your living room! We provide at least two boogie boards, beach chairs, and umbrella. The Brenneckes Beach location was great! We were close to beaches and not far from everything water and island related. The house was clean and had adequate supplies. It even had a hot tub and beach gear available. Thanks for a good trip! Hi Jennifer, I am glad that you found our vacation cottage comfortable for your special time on Kauai. Great Place! Can't wait to return. I almost hate to let our secret out. This place is perfect. Awesome location, quaint cottage feel, attentive service, beautiful grounds. We stayed 5 years ago for our wedding, love the upgrades you made. Thanks Bob! Loved our stay. Such a great place right on the beach. Saw dolphins, whales and some sea turtles from the porch. I am pleased that you and your family enjoyed our vacation cottage next to Brennecke's Beach. This cottage was very nice and clean. It was everything we expected and more. Great location and had that real cottage feel to it. Lots of sea turtles directly in front of it. My husband and I stayed for about a week, and thoroughly enjoyed having this house as our home-base as we explored the island. When the skies were clear enough to enjoy the sunset, we had the best seats in the neighborhood to soak it in from the porch or front lawn chairs. One thing to be aware of - the booking said checkout is 11:00 but the cleaners showed up at 10:00 - so best to confirm in advance if you plan to stay through the morning without feeling rushed. That aside, the stay was smooth and there were plenty of towels and beach gear to help us enjoy the beach right across the road. I am happy that your family found our home enjoyable and convenient. Our departure time has always been 10 a.m. and that is what I confirm at the time of booking. But, I can see that I made a mistake on the HA/VRBO listing that it showed 11 a.m. I do apologize for the confusion. We never want our guests to feel rushed. Our cleaners have a very big job detailing our homes between reservations. I hope your flight home was smooth sailing.